Temple senior Michael Dogbe is excited about seeing a new culture and helping further educate others about football. 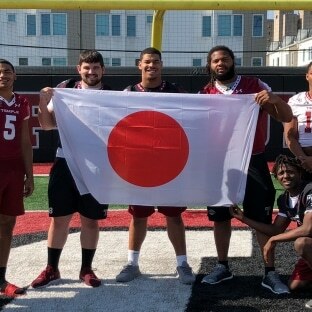 Dogbe, a defensive lineman, is among eight Owls players, in addition to coach Geoff Collins and several staff members, who will leave Friday for a nine-day trip to Japan, where they will help grow the game. The seniors joining Dogbe are quarterback Frank Nutile and offensive lineman Jaelin Robinson. The juniors are linebacker Shaun Bradley, cornerback Linwood Crump, and receiver Isaiah Wright. Sophomores on the trip will be defensive lineman Dan Archibong and center Matt Hennessey. Collins originally was asked to travel to Japan and provide football coaching clinics on player safety, but the endeavor grew from there. The eight players also will be earning three college credits for a summer course titled “Sport, Culture and Tourism in Japan,” taught by Daniel Funk. In addition to providing several football clinics, the class will take trips to three cities: Tokyo, Osaka and Kyoto. The itinerary includes visiting the U.S. Embassy and the University of Tokyo, and seeing a Tokyo Giants baseball game, a sumo wrestling tournament, several temples and shrines, and Dome Corporation headquarters. Dome Corporation is the exclusive licensee and distributor for Under Armour in Japan. In 2015, Temple signed a 10-year deal for $30 million with Under Armour to provide uniforms, apparel and footwear for the university’s 19 varsity sports teams. Temple has a school in Japan, appropriately named Temple University in Japan. The enrollment is approximately 1,100. Jordan said the trip came about because of his role as a member of the Sport Industry Research Center at Temple. Collins views this as a great learning experience for all involved. Temple is coming off a 7-6 season in Collins’ first year, which ended with a 28-3 win over Florida International in the Bad Boy Mowers Gasparilla Bowl. The Owls will open the 2018 season Sept. 1 at Lincoln Financial Field against Villanova. This article is written by Marc Narducci from Philly.com and was legally licensed via the Tribune Content Agency through the NewsCred publisher network. Please direct all licensing questions to legal@newscred.com.